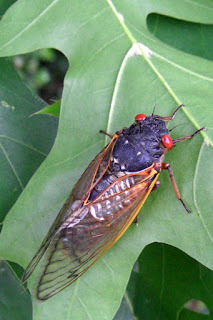 The cicadas that were expected in four years have arrived early. Well, actually, they have been here in the ground. Now they cling to leaves, walk along the sidewalks and fly slowly with much more effort than the fattest bumblebee. They somehow make it up into the trees to sing in a high-pitched tone. Each brood of cicadas has its own creepy beauty. These have orange legs and opaque eyes and such lovely wings, like little leaded glass windows touched with orange at the shoulders. A friend recently discovered some wings that she had saved from the last cicada visitation. Perhaps I will get over my revulsion and collect a few this year.